TPC Overall Rank: #269 out of 2933 rides. User Tracker Count: 410 times. All of WDW has great theming. This attraction could be missed but I would not recommend it. It's fun for the whole family! Me and my family love this ride its a total competion. Its a great ride for parents and kids alike. When I rode it a glitch or somthing happened i ended up getting the max score (999,999) in one shot?!?. Hint- In the first room when you see the big robat with the saw on its hand shoot underneth the hand without a saw youll get an insane amountg of points like 10,000. Hint 2- In the sencond room when your on the alien planet shoot on top of the building that the tram goes through youll get like 5,000 points. Hope you enjoy the ride i certinly did. I remember this being my favorite ride at the Magic Kingdom as a kid, but now it seems shorter and I don't have an excuse for being so bad at it. I play video games all the time, and MY OWN FATHER BEAT ME!!! He hates video games. I got 42,500. This ride gets excellent marks for theming and ride experience. But I have to knock it compared to other shooter rides out there. The turning of the cart is really a neat touch but I found it to be hard to control where you are going and I spent more time spinning around in circles really fast. The targets themselves are not very clearly marked. By the time I would realize what I was shooting at, I was already passed. Combine this with the fact that the guns are mounted onto the car, it makes it really hard to aim and detracts from the shooting experience. Overall this is a real fun ride but I have to knock it down considerably for these faults and its a shame because this could and should be one of the best shooter rides anywhere. The guns are a bit difficult to aim, but once you get the hang of it this ride is good fun. Children will definitely enjoy this ride both as a game and for its &quot;save the galaxy&quot; story; adults will also have a fun time in competition. Really bad ride where you get to shoot your alien enemies and get points. Is this a ride or a video game?? Please bring back IF you had wings! Good shooter ride. I liked that the cars spinned and that the ride was lengthy. the theming was amazing and the ride was great. Pretty good shooting dark ride, but I honestly expected better. 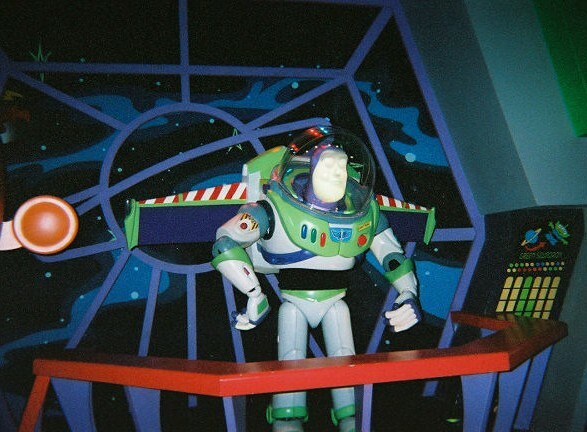 The Buzz Lightyear theming was excellent, as all of the animatronics and targets looked great throughout the ride. The cars also were able to be spun, but the some of the cars cant spin which is disappointing, and the ride was long with plenty of targets to shoot. However, the guns were hard to use since they were mounted to the cars, but they did always work.